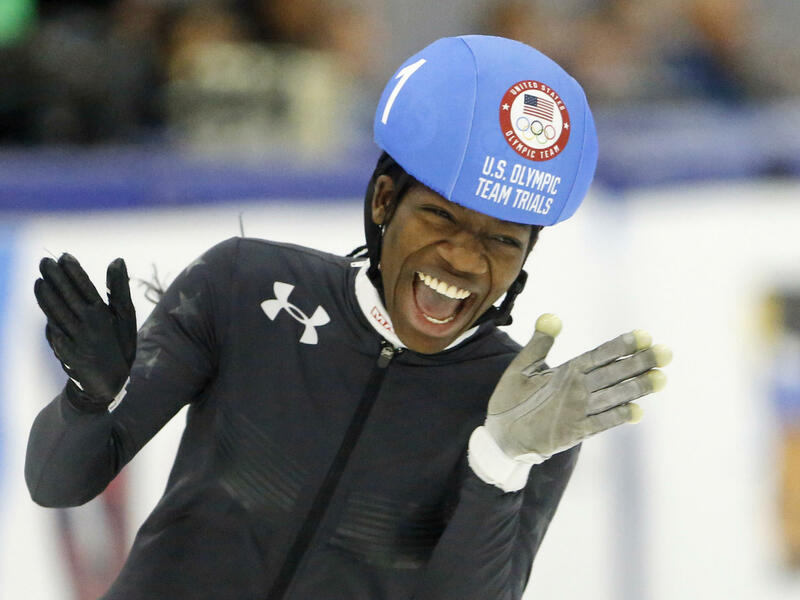 Maame Biney reacts after winning the women's 500-meter A final race during the U.S. Olympic short track speedskating trials in December. Biney skates during a short track speedskating training session in Gangneung on Feb. 6. Biney laughs with her father, Kweku, in December. After visiting from Ghana at age 5, Maame stayed with him in the U.S. Her mother and brother still live in Ghana. 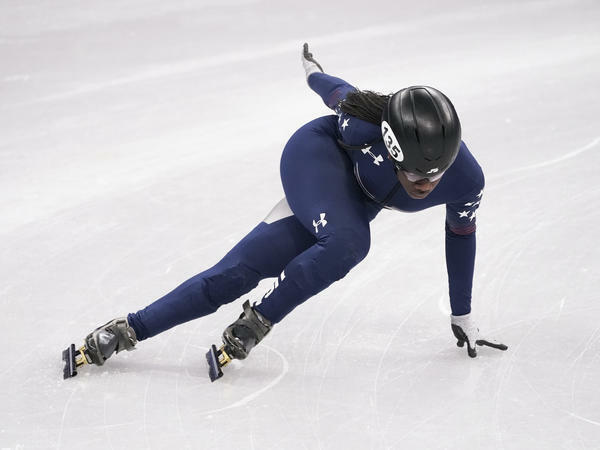 When Biney won the 500-meter finals at team trials in December, with a personal-best time of 43.161 seconds, she became the first African-American woman ever to qualify for a U.S. Olympic speedskating team. (Twenty-five-year-old Erin Jackson is the second, qualifying in long track.) She is competing this week in the women's 500- and 1,500-meter races in Gangneung, South Korea. Biney has a goofy giggle and an electric, nonstop smile. Her game face, though, is something else. "It's not this!" she says. "It's like, 'Don't be in my way, 'cuz I'm probably gonna kill you!' "
And with that, realizing she has blurted something impolitic, she covers her face with her hands and collapses in laughter. Just about everything Biney says ends with her irrepressible teenage giggle. She has a built-in joyfulness that charms everyone she meets, including U.S. team head coach Anthony Barthell. "Even when she's mad, she's still smiling," Barthell says. "That's just Maame." Barthell first saw Biney skate when she was 11, and even then, he realized this girl was special. "Explosiveness?" he says. "She has a ton of that." Biney has the speed and power of a sprinter. It's her powerful start — thighs like pistons, arms pumping — that makes her so formidable in the 500-meter race. But ask Biney what makes her great in short track, and she demurs. "I wouldn't exactly call myself great," she says. "I'll just call myself, like, in there, in the little mix!" That "little mix," though, is brutal. Short track speedskating demands smart, aggressive strategy as the skaters jockey for position on their 111-meter oval track, leaning into tight corners, zooming at speeds up to 30 miles an hour. A false move will send them crashing into the pads. "I like to call myself fierce," Biney says. "Fierce and strong and — just go out there!" Biney took an unlikely path into her sport. She was born in Ghana, where — her father, Kweku, jokes — their only use for ice is to chill beer. Kweku Biney immigrated to the U.S., settling in the Washington, D.C., area. Maame came to visit him when she was 5. She ended up staying; her mother and brother still live in Ghana. One day, driving through the Virginia suburbs, her father saw a sign for a local rink that said "Learn to Skate." Maame tried it, and started figure skating — but she was so fast, the teacher steered her to speedskating. 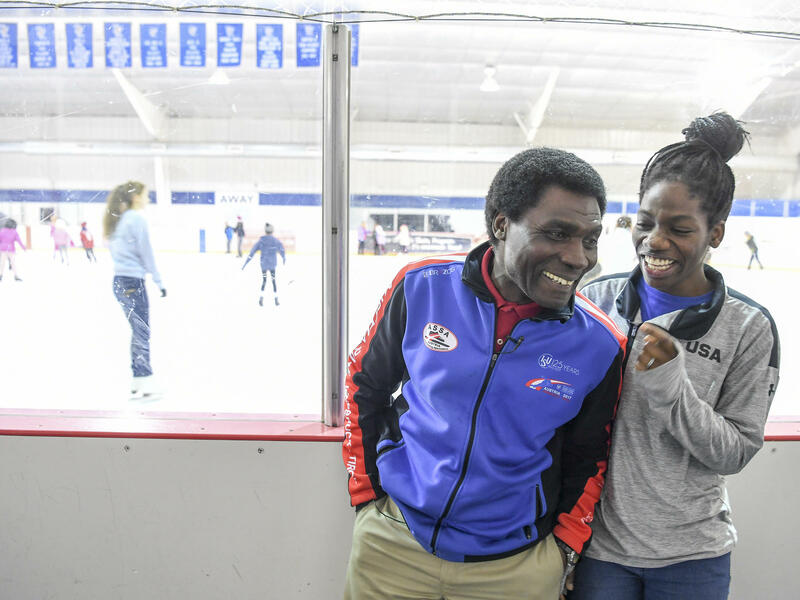 Kweku Biney, who for years took his daughter to her early-morning practices, will be watching from the stands when his daughter competes in the 500-meter race on Tuesday. Maame says he will be holding up the same sign he held at the Olympic trials in December. "Yes!" she says. "He's gonna bring that 'Kick Some Hiney Biney' sign!" So, just how good can this young speedskater eventually be? Barthell sees huge potential. "Once she learns a little more finesse and being able to conserve, she's gonna be even better," he says. "I think you guys have seen only a quarter of what she has. Maybe less than that." For now, Biney is trying to stay focused and shrug off the pressure of these games. It's hard not to feel giddy, though. "When I get on that line," she says, "I'll be like, 'Holy moly! I'm actually here! This is the Olympics! WOW!' "
But she recognizes that her achievement is bigger than herself. "That means I get to inspire other kids in the United States, maybe all over the world," she says, "to just go out there and do what you love, because you never know! You just might accomplish your goal." Short track speedskater Maame Biney just turned 18. She's not even out of high school, but she's one of the biggest names from Team USA at the Winter Olympics. NPR's Melissa Block reports from Pyeongchang, South Korea, on the expectations riding on the athlete's young shoulders and legs. MELISSA BLOCK, BYLINE: Don't be fooled by her goofy giggle and electric, nonstop smile. Maame Biney's game face is something else. BLOCK: Biney has the explosive speed and power of a sprinter. She thunders out of the start, thighs like pistons, arms pumping. ANTHONY BARTHELL: She has pop like a guy, so she has quite a bit of snap. BLOCK: The U.S. team's head coach, Anthony Barthell, first saw Biney skate when she was 11. And even then he realized this girl is going to be special. BARTHELL: Explosiveness - she has a ton of that. BLOCK: Ask Biney what makes her great in short track, and she'll tell you. BLOCK: And that little mix is brutal. Short track demands smart, aggressive strategy as the skaters jockey for position and lean into tight corners, zooming at speeds around 30 miles an hour. A false move will send you crashing into the pads. BINEY: I like to call myself fierce, fierce and strong and just go out there (laughter). BLOCK: And there's that irrepressible teenage giggle that's charmed everyone she meets, including her coach. BARTHELL: Always smiling - even if she's mad, she's still smiling. BARTHELL: That's just Maame. That's the best way to say it. That's just Maame. BLOCK: When Biney won the 500-meter race at team trials in December, she became the first African-American woman ever to qualify for a U.S. Olympic speedskating team. BINEY: That means that I get to inspire other kids in the United States, maybe all over the world, to just go out there and do what you love because you never know. You might accomplish your goal (laughter). BLOCK: Biney was born in Ghana, where, her father jokes, the only use for ice is to chill beer. Her father, Kweku Biney, left for the States, and Maame came to visit him when she was 5. She ended up staying. Her mother and brother still live in Ghana. One day, driving through the Virginia suburbs, her father saw a sign that said, learn to skate. Maame tried it, and obviously it kind of took. Dad has come to Pyeongchang. He'll be in the stands when Biney races tomorrow, and he'll be holding the same sign he held at the Olympic trials. BINEY: Yes, he's going to bring that kick some hiney, Biney, sign (laughter). BLOCK: A few days before her first Olympic race, Biney was thinking about her dad, hoping he'd made it to Korea safely. BINEY: Because I worry about him sometimes whenever he comes to a new country because, like, he's all alone, and he doesn't know where he is. BLOCK: But in her pocket now she has a new way to reach him - a new phone - an older model iPhone 6S that she got for her 18th birthday. BINEY: It's silver. I wanted the rose gold, but they didn't have it, which is OK because at least I got a phone, which is all I've ever wanted. BLOCK: So how good can this young speedskater be? Coach Barthell sees huge potential. BARTHELL: Once she learns a little more finesse and being able to conserve, she's going to be even better. Like, I think you guys have only seen a quarter of what she has, maybe less than that. BLOCK: Right now Maame Biney is trying to stay focused and shrug off the pressure. BINEY: But when I get on that line, I'll be like, holy moly, I'm actually here. This is the Olympics (laughter), wow. BLOCK: Maame Biney will toe the start line in the 500-meter short track race tomorrow. Melissa Block, NPR News, Pyeongchang, South Korea. (SOUNDBITE OF ANDREW BIRD SONG, "TRUTH LIES LOW") Transcript provided by NPR, Copyright NPR. Chris Mazdzer has used his runners to etch himself a place in history. 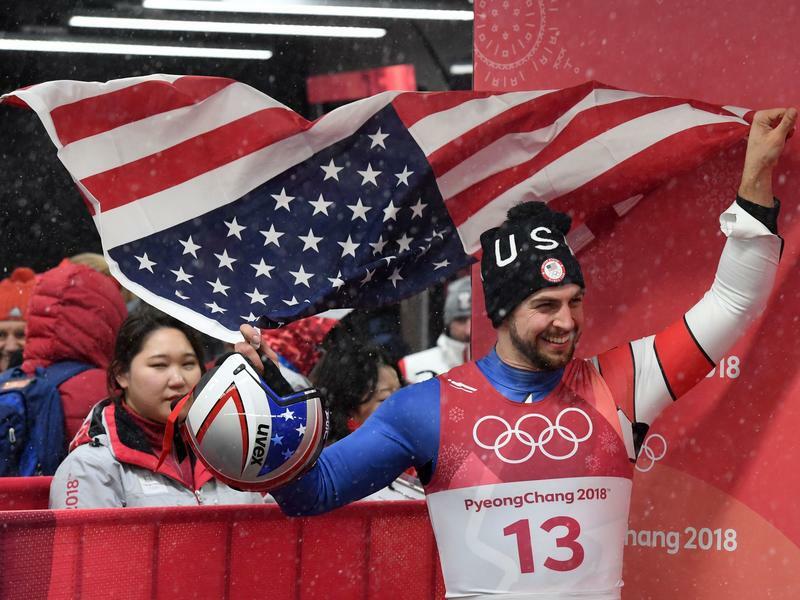 The 29-year-old won silver in singles luge on Sunday, becoming the first American man ever to medal in the event. His podium finish ends a drought that extends to the sport's Olympic debut back in 1964. Also on that podium were Austria's David Gleirscher, who won gold in a shocker of his own, and bronze medalist Johannes Ludwig of Germany. 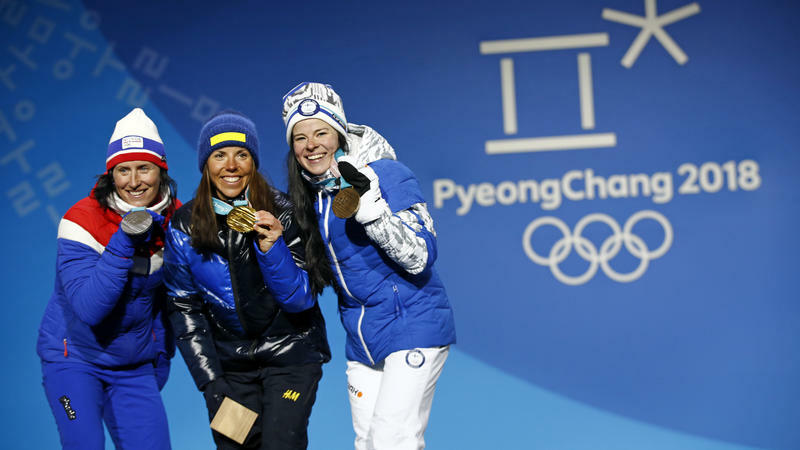 Sweden won the first gold medal of the Winter Games on Saturday, but the United States and Norway also made history on a blustery and bitter cold day in Pyeongchang, South Korea. Swedish cross-country skier Charlotte Kalla won top honors in the women's 15-kilometer skiathlon with a finishing time of 40:44.9. The opening ceremony for the Pyeongchang Winter Olympics will take place Friday, but the first competitions are already underway. 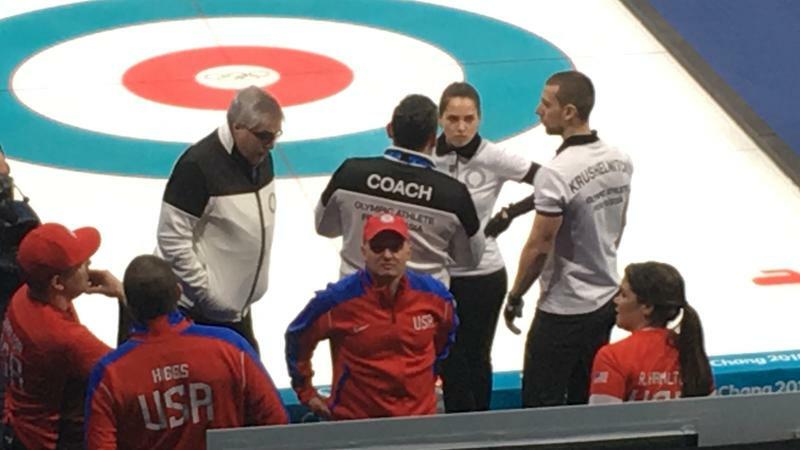 The U.S. curling team of Matt and Becca Hamilton led off a mixed doubles tournament by defeating a team from Russia. There was a smattering of applause for each team as they were announced. The loudest cheers were reserved for the host South Korean team, which was also on the ice as part of the mixed-doubles tournament at the Gangneung Curling Center.